WHAT: Join us for a facilitated conversation on reproductive justice, choice and a discussions around the latest anti-choice organizing on campus and in Kingston. 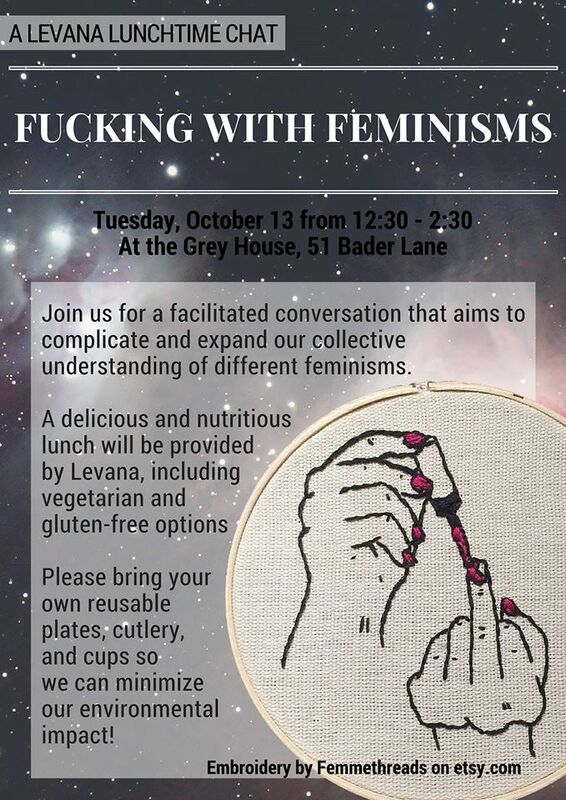 A delicious vegan and gluten free dinner will be provided. Please bring your own bowl and cutlery to minimize our environmental impart. 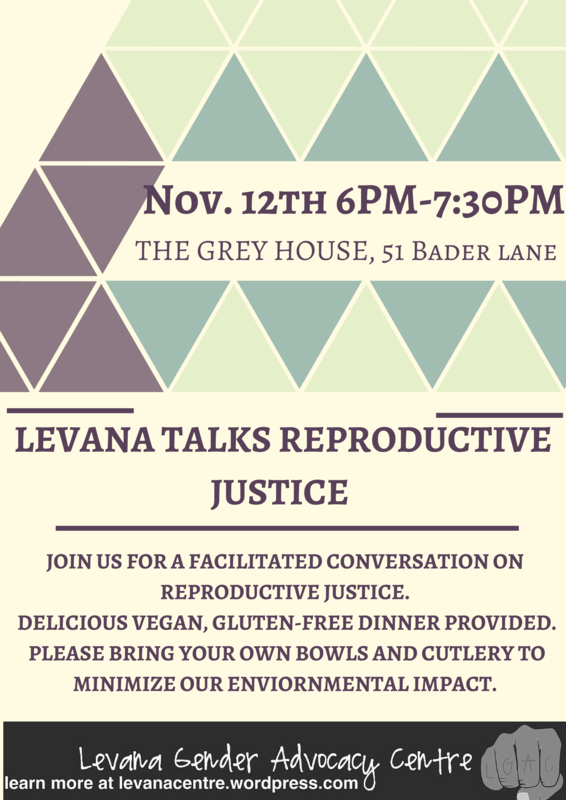 Author levanacentrePosted on November 6, 2015 November 19, 2015 Categories UncategorizedLeave a comment on Levana Talks Reproductive Justice! Levana Presents: Science Fiction and Social Justice Reading Group 1st Book! WHAT: The Levana Gender Advocacy Centre’s reading group this year is themed “Sci-Fi and Social Justice”! So to honor that theme, the first book of the year will be Nalo Hopkinson’s Midnight Robber! “It’s Carnival time, and the Carribean-colonized planet of Toussaint is celebrating with music, dance and pageantry. Masked “Midnight Robbers” waylay revelers with brandished weapons and spellbinding words. But to young Tan-Tan, the Robber Queen is simply a favourite costume to wear at the festival–until her power-corrupted father commits an unforgivable crime. Between now and November 25th, grab a copy of the book, give it a read, and then come hang out with other cool folks that read it to talk about it over snacks, tea, and coffee. 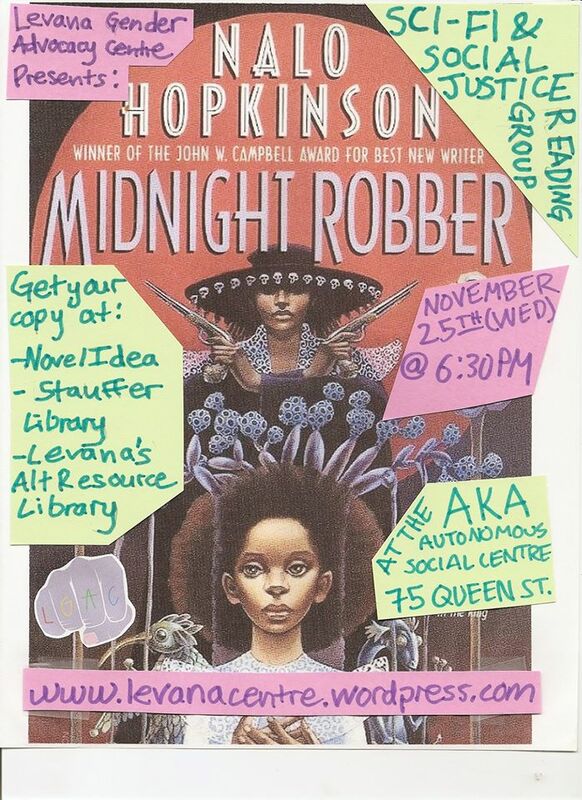 LOCATION: We’ll meet at 75 Queen Street (up the ramp) at 6:30 PM on Wednesday November 25th to hang out and chat about Midnight Robber. We’ll also have an opportunity to talk about potential books for the remainder of the reading group series. 75 Queen Street is wheelchair accessible and houses a gender-neutral, single-use washroom on site. It is also a scent-free space; for this reason, we ask attendees to avoid scented products for this evening. Author levanacentrePosted on November 6, 2015 November 6, 2015 Categories UncategorizedLeave a comment on Levana Presents: Science Fiction and Social Justice Reading Group 1st Book! 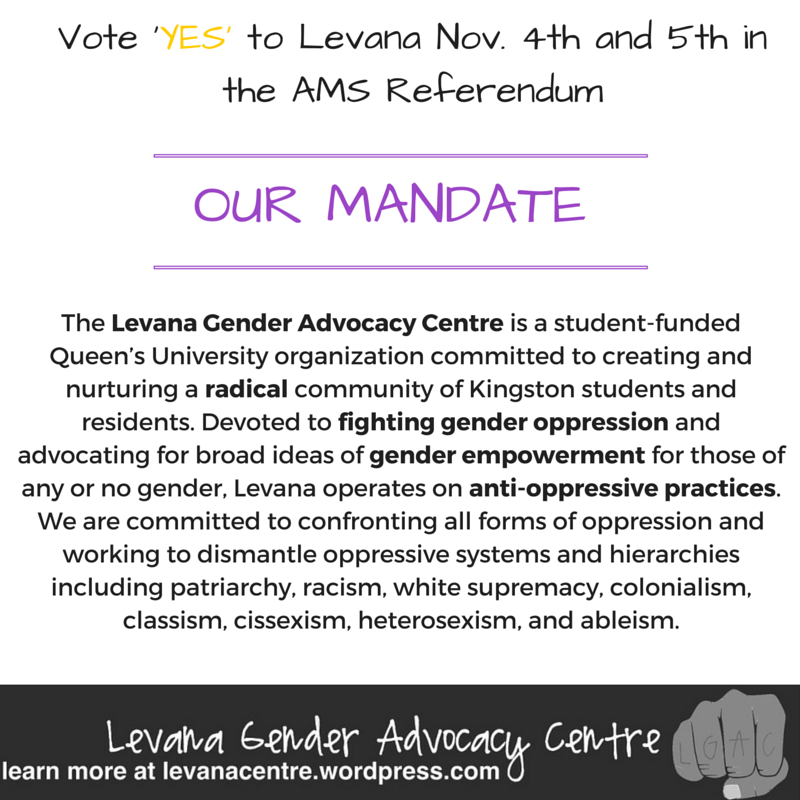 Levana is campaigning for the AMS Fall Referendum! Following the approval of our question by the AMS assembly Thursday night, Levana began the campaigning period Friday (lasting until November 3rd) for the Fall referendum. During this time, we will be giving brief class talks about our existing programming and what we intend to use a (opt-ouble and optional) student-fee for! We will also be posting graphics here, as well as our Facebook, that outline briefly the history of Levana and our location (the Grey House), as well as the work that we do. The first graphic, outlines our mandate! Author levanacentrePosted on October 24, 2015 October 24, 2015 Categories UncategorizedLeave a comment on Levana is campaigning for the AMS Fall Referendum! Friends of Levana, WE NEED YOUR HELP! *****UPDATE: After a long fruitful day collecting nomination signatures for the AMS Fall Referenda, we now have 413 signatures in total!! Due to our success Saturday, we will NOT be collecting signatures SUNDAY. A HUGE thank-you to everyone that signed up for a shifts, and to all our lovely friends and supporters!! We have to collect 400 signatures by Monday at 11:30 in order to secure our nomination for the Fall AMS referenda. We faced some unexpected hiccups with our nomination process, so we’re working withinin a much smaller timeframe than we had initially planned. We’re seeking a bunch of rad folks to spend an hour or more collecting signatures on Queen’s campus tomorrow through Monday. Levana members will be in the Grey House at 51 Bader Lane throughout the weekend and on Monday morning. You can meet us there at the beginning of your shift to grab a clipboard and bring it back when you’re finished. Author levanacentrePosted on October 16, 2015 October 17, 2015 Categories UncategorizedLeave a comment on LEVANA NEEDS YOUR HELP! First Lunchtime Chat Series Event of the Year! Discussion topics might include: our relationships to feminist identity, different feminist conversations and struggles, challenging white feminism, complicating the ‘wave’ narrative. A delicious and nutritious lunch will be provided by Levana, including vegetarian and gluten-free options. Please bring your own reusable plates, cutlery, and cups so we can minimize our environmental impact! WHEN: Join us on Tuesday October 13 from 12:30pm to 2:30pm for a facilitated conversation that aims to complicate and expand our collective understanding of different feminisms. Author levanacentrePosted on October 3, 2015 Categories UncategorizedLeave a comment on First Lunchtime Chat Series Event of the Year! On Monday September 14, the first day of fall semester come join organizers, activists, academics, feminists, and folks from all corners of the campus for a cookout on the Grey House lawn! 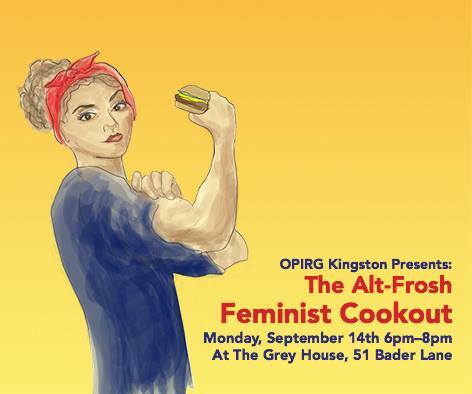 Celebrate the kick off of Alt Frosh 2015 and all the great work feminist organizations and organizers have brought to Queen’s while mourning the closing days of summer. The food is free, and we strive to meet as many dietary restrictions as possible – there will be halal, vegetarian, vegan, meaty, and gluten free options available! In order to make this event more sustainable, if you are able please bring your own plate/bowl and cutlery. This event is brought to you by: OPIRG Kingston, the Levana Gender Advocacy Centre, the Sexual Health Resource Centre – Kingston, ASAP – Awareness of Sexual Assault Prevention, the Education on Queer Issues Project (EQuIP), Women in Science and Engineering, Queen’s White Ribbon Campaign, ASUS Equity and Diversity Commission, Half the Sky, SGPS Equity Committee, Collective Reflections, and Performance Outreach for Student’s Social Engagement (POSSE). WHAT AND WHERE: Join at Market Square (corner of King and Brock) to show your support for refugees in Kingston. More details coming soon. Please share widely! Author levanacentrePosted on September 6, 2015 Categories UncategorizedLeave a comment on Refugees Welcome!